A Framed Production Storyboard used during the making of Robert Zemeckis' 1988 groundbreaking comedic thriller, Who Framed Roger Rabbit. 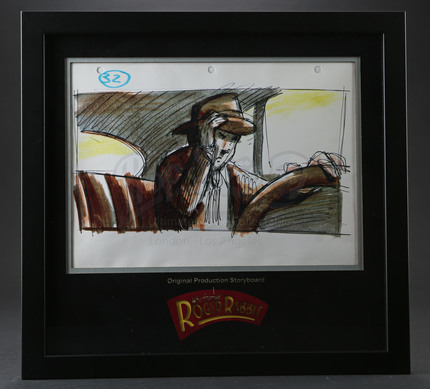 Seamlessly blending live action and hand drawn animation, the film follows toon-despising private investigator Eddie Valiant (Bob Hoskins) as he attempts to solve the murder of Marvin Acme and prove the innocence of the cartoon movie star, Roger Rabbit. 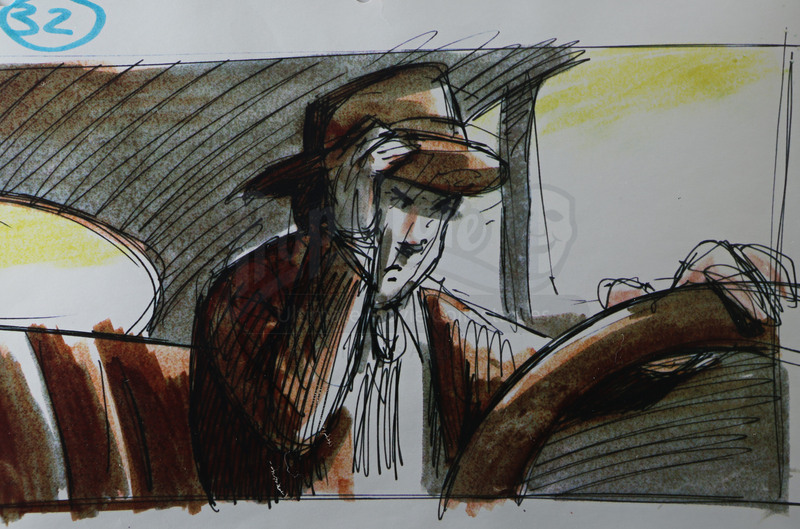 Storyboards of this style were photocopied and distributed amongst the crew during production as a means of visualizing key sequences. This storyboard contains an imagine of the action taking place in the scene. Originally drawn by an unknown artist, this copied illustration features numerical notation around the main image. The page appears to have been hole punched on the right side of the page, where it was grouped in a sequence, forming a comprehensive shot-by-shot version of the film's special effects. These fantastically detailed drawings come presented in a custom built display with laser cut mount board featuring the movie title. The frame measures 14.75' x 14' (37.5 cm x 35.6 cm).